The kitchen area includes a small fridge, a Keurig coffee maker, electric kettle, microwave and a toaster oven. There is no oven or burners in the unit. There is a gas grill that is available for your use. We also have another rental unit on the property, which is great if you want to travel with another couple/ friends. It is VRBO 969757 - please check it out! The other unit has a stove too. You will have the pool house all to yourselves during the stay. You are also welcome to enjoy the pool ! There is plenty of parking should you decide to rent a 50cc motor bike or a Twizy electric mini car. We also have a Twizy charging station on the property for your convenience. We have towels, beach towels, iron, hair dryer and shampoo all here for your use. There is cable TV, wifi and air conditioning. Bermuda's largest nature reserve, Spittal Pond is a 10 minute walk from our property. It is a great, diverse walk. There are 2 very good restaurants in Flatts Village about a mile away, Rustico and the Village Pantry. Flatts is also home to the Bermuda Aquarium. Collectors Hill area is about a mile away and has a few restaurants, a pharmacy, grocery store and a gas station. Hamilton and St. Georges are each about a 15 minute taxi or bike ride away and offer many restaurants and shopping. We are happy to help with any questions on the property or Bermuda in general throughout your stay. You can reach us by phone if we are not at home too. We want you to have an enjoyable holiday in beautiful Bermuda! We are pretty relaxed people. We are available to help you when you have any questions, but we won't be bothering you otherwise. We do have 2 dogs that roam around the property - they also enjoy meeting new people! There is a pre-paid phone which is available. It costs $2.50 a day for unlimited local calls and texts only if the phone is used. There is an ipod dock. The property was very nice in a quiet area convenient by motorbike to beaches, stores and restaurants. The pool house was very clean and the bed was comfortable. Chris and Gail were friendly and very helpful when needed. The dogs Tess and Abby were adorable and well behaved. They greeted us each day when we came back to the house. 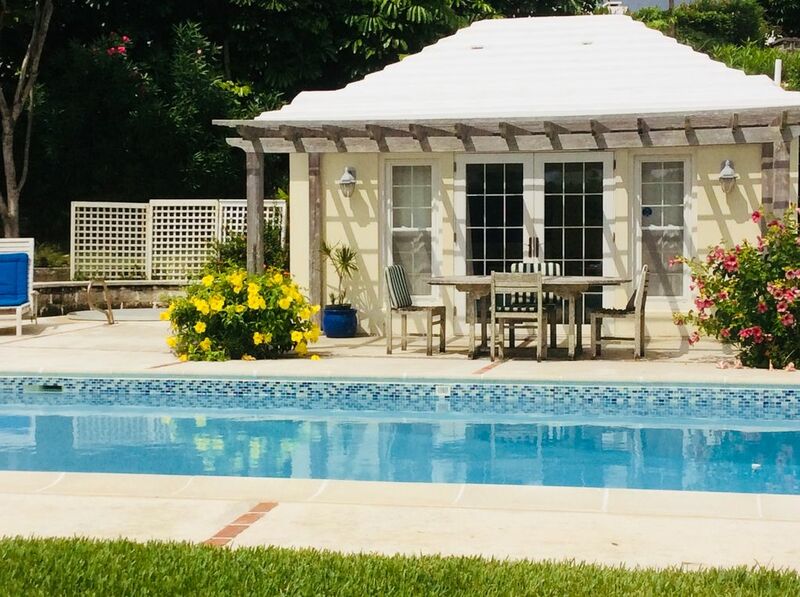 Very comfortable poolside bungalow with excellent hosts. We enjoyed our visit to Bermuda and our comfortable studio provided by hosts Chris and Gail. They were very accommodating, providing information about their island and we always felt at ease knowing they were on the property with Tess and Abby, their two lovely labs. We spent most of our time exploring all over Bermuda, traveling by bus service or ferry to many places. A 7 day pass provides unlimited access to both and leaves you free to see everything and talk to always friendly local folks while someone else is driving. We look forward to returning to Bermuda many times. Thank you both so very much, Ken and Cynthia, Oroville, California. The pool house was a lovely spot -private, yet close to the bus and Beaches. Chris and Gail are wonderful and gracious hosts. The poolhouse provided everything we needed for a three night stay, and Chris and Gail were incredibly hospitable. They took care of all our needs to make our stay in Bermuda a great one. We'll be staying here again when we return to bermuda! Loved the property with all the privacy. Pool house was very nice and cozy. Tess and Abby were always there to greet us and watch over us which was very nice. We swam in the super nice pool every day. We had breakfast at specialty and Angie's which was very good. Thank you again Chris and Gail for the opportunity to stay in the pool house. Cancellation Policy: 100% if cancelled more than 15 days prior to the Check-in Date; and 50% if cancelled more than 7 days prior to the Check-in Date.